For 49ers fans interested in seeing what top draft picks A.J. Jenkins and LaMichael James can do in an NFL game, this Sunday might be the rookies’ coming-out party. A season-ending injury to wide receiver-kick returner Kyle Williams in the victory over New Orleans Sunday and an ankle injury to backup running back Kendall Hunter could finally give Jenkins and James some playing time. The 8-2-1 49ers travel to St. Louis Sunday to face the 4-6-1 Rams. Williams will be placed on injured reserve, opening up a roster spot, which is likely to be filled by former Eagles receiver-kick returner Chad Hall (a former standout Air Force quarterback). 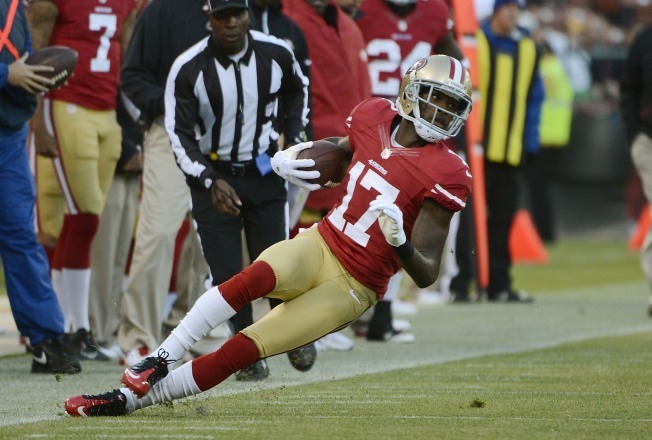 But Williams’ injury could also mean a move up the depth chart for Jenkins, the 49ers’ No. 1 draft pick this April out of Illinois who has yet to play a snap this season. With Hunter likely out for the Rams game, James – the second-round pick in April out of Oregon – could also play his first snaps of the season in relief of Frank Gore. Hall could fill in for Williams on punt return duties, reports Matthew Barrows of the Sacramento Bee, as could backup cornerback Perrish Cox, Jenkins or James. Wide receiver-returner Ted Ginn Jr. also injured his wrist in the victory over New Orleans, and his status for Sunday’s rematch with the Rams – who tied the 49ers 24-24 in an overtime game Nov. 11 – is uncertain. Jenkins, the 30th overall choice in the April draft, has been unable to get playing time behind a group of wideouts that includes Michael Crabtree, Randy Moss, Mario Manningham, Williams and Ginn. But Jenkins is a speedster (who reportedly went under 4.4 in the 40-yard dash at the NFL Combine) who put up big numbers in college and is considered a deep threat. He’s only been active for one game, the season opener in Green Bay, but did not get into the game. James, likewise, has been unable to crack the rotation of running backs led by Gore, Hunter, Anthony Dixon and Brandon Jacobs, who got his first carry of the season last week. For Williams, his season ends with a torn ACL, and he Tweeted Monday that he’s done for the year.